A Long March 3C launch vehicle soared skyward on Sunday, June 12 to replenish the country’s homegrown BeiDou satellite navigation program. The rocket, carrying the BeiDou-2 Compass G7 spacecraft blasted off at 11:30 a.m. EDT (15:30 GMT) from the Launch Area 3 at the Xichang Satellite Launch Center in China’s Sichuan Province. The Long March 3C booster took to the skies to complete a short vertical ascent before it started heading south-east. 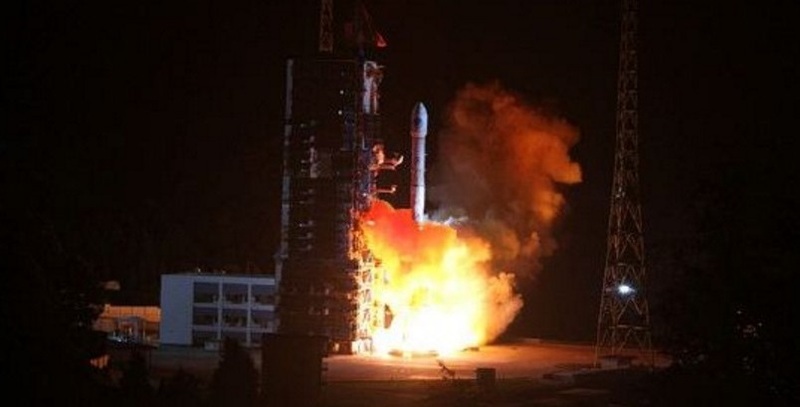 The successful launch of the mission was confirmed by Chinese state-run media slightly over one hour after liftoff. The rocket’s first stage burned for about two minutes and 20 seconds to accelerate the launch vehicle throughout the important first phase of the flight. Approximately 20 seconds later, the first stage was jettisoned and the second stage assumed the control over the mission. Burning for about three minutes, the rocket’s second stage continued to lift the spacecraft, raising its altitude. When the second stage separated, the third stage led the mission towards designated geostationary orbit. The spacecraft’s deployment occurred some 26 minutes into the flight. BeiDou-2 Compass G7 belongs to the second generation of China’s BeiDou Navigation Satellite System and is the 23rd satellite in the network. This phase, known also as the Compass Navigation Satellite System, is designed to provide continuous, real-time passive 3D geo-spatial positioning and speed measurement. Built by the China Academy of Space Technology (CAST), BeiDou-2 Compass G7 is based on the DFH-3 bus. This platform measures 7.2 by 5.6 by 6.6 feet (2.2 by 1.7 by 2.0 meters) and weighs about two metric tons. The bus is fitted with a laser retroreflector for precise orbit determination, a phased array antenna for the transmission of navigation signals, a C-Band ranging antenna and additionally a S/L-band dish antenna. The spacecraft is expected to offer its services for about eight years. BeiDou-2 Compass G7 will join other BeiDou satellites already in orbit to improve the stability of the system, preparing the network to offer global coverage. This 2nd generation of the network began offering services for the Asia-Pacific region in December 2012. The deployment of the third phase commenced in 2015 and is expected to reach its full operational capability by 2020. The full constellation of BeiDou spacecraft will consist of 35 satellites. BeiDou is very similar to the navigation system provided by GPS and the European Galileo, and it is designed to achieve similar performances. The network will be dual use: a free service for civilians, and a licensed service for the Chinese government and military. The civilian service will provide an accuracy of about 33 feet (10 meters) in the user position, 0.45 mph (0.2 m/s) on the user velocity, and 50 nanoseconds in time accuracy. The restricted military and authorized users’ service will provide higher tracking accuracies of 0.33 feet (0.1 meters). The system is operating since 2000. It is composed of three parts: the space section, the ground section, and the user section. The space section comprises five geostationary orbit satellites and 30 non-geostationary orbit satellites. The ground section consists of a certain number of stations: the main control stations, the injection stations, and the monitoring stations. The user section includes terminals of the BeiDou system and some compatible with other navigation satellite systems. The 185 feet (56.3 meters) tall Long March 3C rocket that was used in Sunday’s mission is a three-stage launch vehicle, designed to deliver up to 3.8 metric tons of payload into a geostationary transfer orbit (GTO) and up to 9.1 metric tons to low-Earth orbit (LEO). Its maiden launch was conducted on April 25, 2008. BeiDou-2 Compass G7 is China’s seventh mission of the year and the 229th flight of the Long March rocket series. In 2016, China intends to carry out more than 20 space missions. China’s next flight is currently planned for June 27, 2016, when a new version of the Long March booster, the Long March 7, will conduct its maiden flight, carrying the country’s next-generation re-entry capsule. It will also be the first flight conducted from the Wenchang Satellite Launch Center, located on Hainan Island, in southern China.